The Derby isn't only about teams…are you a single batter? Posted By PA Breast Cancer Coalition on June 25th, 2010 at 2:00 pm | 116 comments. Previously I have written about our need for Home Run Derby sponsors and volunteers. And we still do need both! If you’re interested, click here to learn more or sign up. 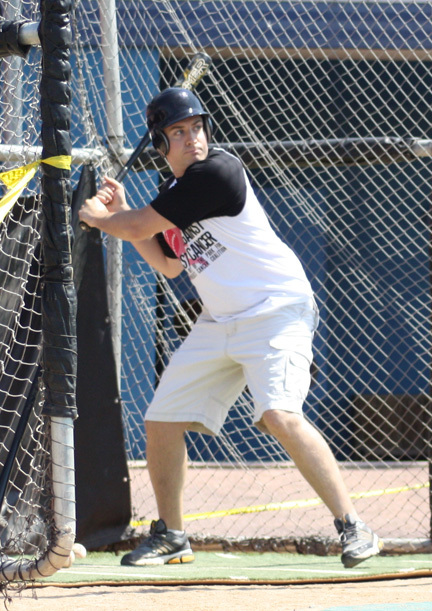 The Home Run Derby events are major fundraisers for the PBCC. Funds are raised through sponsorships, team fees, single batter fees, and donations. Today, I am focusing on single batters. For the low, low price of just $125 you can have an experience of a lifetime! Imagine the scene. You put on a batting helmet, grasp a baseball bat and step out onto home plate on your local minor league baseball field. You sling the bat over your shoulder and take a few warm up swings. The pitching machine whirs to life as you eye the outfield fence and wonder….could I? Could I really hit a home run? Well why not give it a try? Batters are scored on a scale ranging from 10 points for a fair ball hit in the infield to 100 points for a home run. The individual batter at each stadium with the highest point score is awarded a prize. You will be given a batting time slot when your registration and payment is submitted to the PBCC. All money raised through the Home Run Derby stays in Pennsylvania and allows the PBCC to continue supporting and serving breast cancer survivors and their families in this state. Please consider becoming a Home Run Derby batter today! We can’t help the thousands of women in PA who are dealing with breast cancer without your help! Posted By PA Breast Cancer Coalition on June 4th, 2010 at 9:30 am | 127 comments. The students at Brecknock Elementary School in Eastern Lancaster County School District collected and donated over 560 items for the PBCC, including gardening tools, books, handmade cards, silk scarves, and even feather boas! In honor of Lisa Horning, a third-grade teacher at Brecknock for 18 years who died after a long battle with breast cancer on September 20th, students at the school participated in their first “Day of Service,” which benefitted three causes, including the PBCC. The idea to support the PBCC during the “Day of Service” actually came from Madison, the daughter of one of Brecknock’s teachers. She saw our pink van (check out the video of its creation) driving around town and asked her mom about it. The rest is history. We especially LOVED the homemade ornamental angel keychains and “Get Well” cards. Each item carried the message, “Because Brecknock Cares,” which Lisa Horning came up with several years ago. What a wonderful way to honor a loved one AND support a noble cause. Thanks, Brecknock Elementary School! Posted By PA Breast Cancer Coalition on June 3rd, 2010 at 10:45 am | 112 comments. Here at the Pennsylvania Breast Cancer Coalition, we believe in reaching those diagnosed in the state individually. The Friends Like Me Care Packages do just that every day. These pink boxes, which contain valuable information, books, and donated gifts, make it to Philadelphia, Erie, Pittsburgh, Scranton, and everywhere in between. To date, over 3,400 Friends Like Me Care Packages have made it into the hands of newly diagnosed men and women in PA. Included in each package is a quick survey that we ask recipients to complete. The last question is “What did receiving this Friends Like Me Care Package mean to you?” Below a quick note that was sent back recently. My “Friends Like Me” package arrived a few days after meeting with my surgeon and scheduling my surgery. I cried when I opened the box. It was a tangible representation of my cancer and a powerful gift. Filled with information, it empowered me to ask and learn more. I wanted to be actively involved in my treatment plan. Along with my surgeon and her staff at Penn State Hershey Breast Center, my family and friends; you too became part of my support team. Kim Eubanks’ note personalized my package. I remembered her from church and thought it remarkable that she remembered me. I’m sure many packages are sent weekly – to remember me and take the time to send a note meant the world to me. Thanks Kim! I read Navigating Breast Cancer by Lillie Shockney shortly after receiving it with my cancer information at Hershey. It dealt with many of the issues I was dealing with like how to tell others and what lies ahead. Reading the book gave me a sense of normalcy. Others had gone through the same emotional rollercoaster I was living. I read her Breast Cancer Survivor’s Club from my Friends Like Me package as a sequel. The Breast Cancer: Covered or Not by Dr. Linda Rhodes and Pat Halpin-Murphy provided easy to read information on health insurance. I have insurance through my employer but had only ever used it for wellness and routine family doctor visits. I read the book right away and called the insurance company just to “double-check” what I thought I knew. I needed to focus on getting better, not fighting with insurance. I laughed when I saw the knit hat. Made from bright, fuzzy yarn, it wasn’t my “style” and chemo wasn’t in my treatment plan, but I will wear it proudly. It reminds me to laugh each day. It also serves to remind me that my cancer was found early and with radiation, my outlook is good. Not everyone is as fortunate. I read all the books and pamphlets in my package. My husband wears the pink ribbon sticker. I wear the “survivor” bracelet and pink ribbon pin. The angel made by the Girl Scout Troop hangs from the rearview mirror of my car. All reminders of where I’ve been and how far I’ve come. In February I had a lumpectomy at Penn State Hershey Medical Center. I learned that my lymph nodes were clear. I will have radiation. I have been blessed. These personal stories are behind the PBCC’s driving force to find a cure now! Do you know someone who was recently diagnosed? 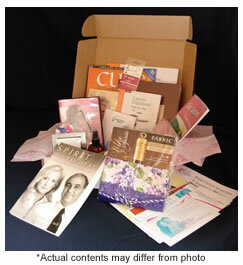 Visit the PBCC’s Friends Like Me page to request a Care Package be sent FREE of charge! Can Your Business Help Take A Swing Against Breast Cancer? Posted By PA Breast Cancer Coalition on June 1st, 2010 at 10:14 am | 44 comments. Last week I wrote about our need for Home Run Derby volunteers. And we still do need volunteers! If you’re interested, click here to learn more or sign up. 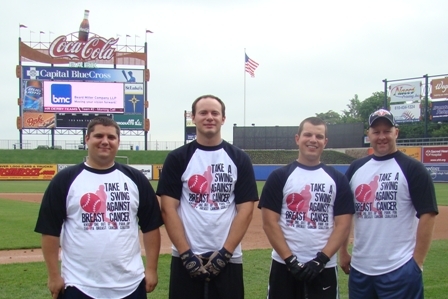 The Home Run Derbies are major fundraisers for the PBCC. Funds are raised through sponsorships, team fees, single batter fees, and donations. Today, my focus is on sponsors. Home Run Derby sponsorships range from $1,000 to $10,000, with wonderful benefits given at each level. Just imagine what a $5,000 or $10,000 sponsor receives! The promotional and marketing opportunities are well worth the cost! Plus, your company will be seen in a positive light by linking with the PBCC, a statewide non-profit breast cancer organization. To see all the sponsorship levels and benefits, click here. Please consider becoming a Home Run Derby sponsor today! We can’t fulfill our mission, to find a cure for breast cancer now…so our daughters won’t have to, without your help!